I’m getting heartily sick of this Twit(ter) | Curly's Corner Shop, the blog! Public officials need some sort of protection from this behaviour! When will Cllr. 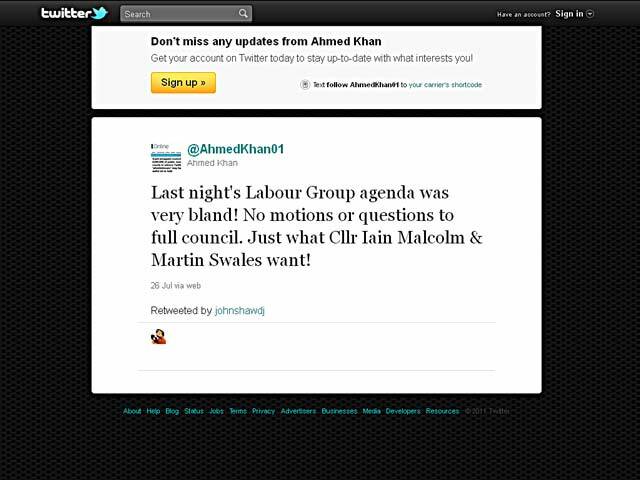 Khan and his South Tyneside Independent Alliance colleagues learn that this sort of behaviour is simply not acceptable! They have had a penchant over the years for attacking public officials and now seem to think it is quite OK to link them to the Labour Party. Well it is simply not OK! The Chief Executive of South Tyneside District Council deserves a little more respect than this. This “tweet” is an abuse of the man and of his position, let me be quite clear (particularly as I am noted for not being the world’s biggest supporter of the Labour Party) that the position of Chief Executive, or an other Executive Director at the council, or even a lower ranking manager or official should always be regarded as apolitical, neutral, and out of the reach of party politics. They are public servants paid by us to administer the policies of the party that was democratically elected by the people of South Tyneside. I may not like Labour’s policies but fully accept that they have an overwhelming popular mandate here to enact them, I also understand fully that officers of the council would have to administer the policies of any other party should they be elected in the sort of numbers that Labour enjoy. Therefore it is no use having any sort of openly held political viewpoints if you are a paid public official. Is there no way to protect our officials from these demeaning, denigrating, presumptuous and sniping tweets from this South Shields councillor? There are standards laid down, but Khan appears to ignore them with seeming impunity. Surely the Council’s Constituton could be referred to regarding acceptable public behaviour and treatment of Officers, as well as guidelines by the Standards Board regarding tweeting and acceptable behaviour of elected Councillors. Employees of the STC would be disciplined if they tweeted or blogged in a similar vein. If these snipers spent their time devising and publicising constructive ways of saving public money, regenerating business,delivering improved public services, exploring the viability of shared services, promoting local tourism etc. Conservative Home Local Government features interesting, constructive contributions from Councillors who are a credit to their communities, even though I may not agree with their politics. Tweets like this are damaging to the reputation of our borough he should be sacked. I thought Ahmed is an employee of the council and hes chanting hatred against its leaders . If an employee defames the company name they get dismissed and so should khan. An elected Councillor is not an employee, but should be subject to some effective constraints; ultimately removal is in the hands of the electorate. He plays the role of the victim of an alleged attack on “freedom of speech” by STC, and courts support from people, who have little or no idea of the damage that is being done to ST by this twitting/blogging as well as an apparent support for, or, according to STC, alleged involvement in the “Monkey” blog without considering for one second how they would feel if they or their relatives/friends/colleagues were victims of such alleged defamatory, and malicious bloggings. A long silence from both protagonists would be most welcome, between them they are displaying the capacity for wrecking the cases of all the other participants. Like i said not that long ago, One RULE for the council another for the rest of us. If someone can explain the meaning of that non contextual quote, please do so. Curly, myself, contributors to this blog like yourself are not publicly elected officials or,as far as I am aware, senior STC council employees, and, as such, thankfully not targeted by anonymous, allegedly malicious and potentially defamatory blogs and tweets, however, I am acquainted with some of those targeted, and, unless action was taken, others would be discouraged from seeking election as councillors or working in a senior officer role for STC.As previously stated, any organisation, whose officers and officials were subject to such public verbal attacks would have little or no choice, but to investigate the source, whether, a council or a private sector business. Most of the plaintiffs have wisely maintained a discreet and patient silence and let the lawyers/investigators get on with their job, and it is a pity that all parties did not follow their example. As Curly has repeatedly stated the individual plaintiffs can now pursue a civil libel claim at their own expense if they so wish. It will be interesting to see where the proposed police investigation leads. One of those bitten by the primate(s) has bitten back by naming names, bearing in mind that all were given a copy of the lawyer’s report, we can only assume that they were not bound by some form of confidentiality agreement, and that, if they so choose, are free to go public on the subject. Sue, Grabbit and Run could be very busy in the months to come, as could Inspector IT Gadget&Co. Don’t know if I’m getting a little over cautious or paranoid in reading between the lines, but this unguarded tweet worried me a little. They can get advce from whoever they like but if they are found to have passed on confidential information obtained in the course of their employment they are toast! There are legitimate channels in the workplace for public interest disclosures. Passing info to anonymous bloggers does not count. Spot on, Ispy, that’s why I suggested getting some objective advice, which could be summarised as you have so aptly put it as “they are toast”; hopefully they read this blog. Strange that never a comment from Khan wends its merry way to “Curly”. Cllr. Khan would never again leave a comment here LL.B, as he suspects I keep an eye out for certain IP addresses, in one voicemail message voluntarily left on my mobile phone he attested that “I have NEVER commented on your site or any other ****ing site”. I have lots of evidence that wholly contradicts this! When do the public find out who was responsible for the blogging on the mr monkey case? I think when we find out who dunnit they will get fame and fortune anyway julian assange style. National press appear to have “dropped” the story, strange, given that the identities of those alleged to have promoted the blog are now in the public arena. The self publicist around here has now made a Monkey out of a number of national journalists. As well as those unwise enough to put their jobs at risk by blowing assorted whistles, and supportive tweeters who probably have little or no idea where South Shields is let alone what the local political and economic scene is.